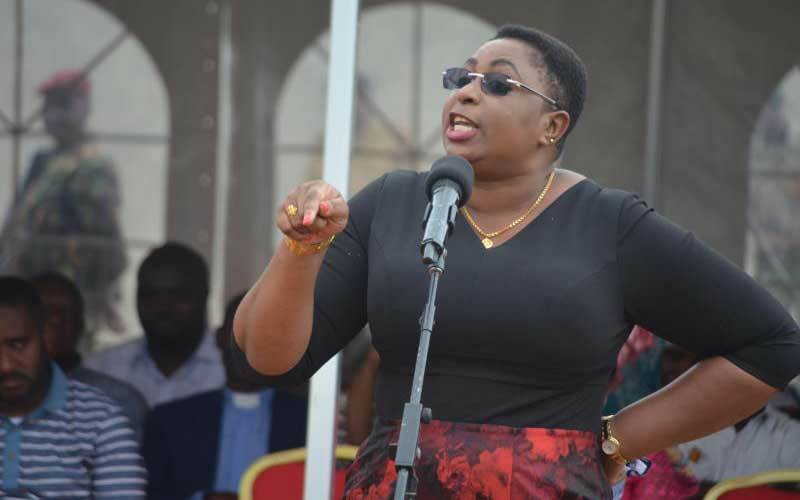 Sunday April 14, 2019-Malindi MP, Aisha Jumwa, has castigated Central Organisation of Trade Union (COTU) Secretary General, Francis Atwoli and Mombasa Governor ,Ali Hassan Joho, for claiming that Deputy President William Ruto will not be in the presidential ballot come 2022. Speaking in Mogotio, Baringo on Saturday, Jumwa said if someone feels competent for the presidential seat then he should appear in the ballot and Kenyans will vote. According to Jumwa Atwoli should appear in the same ballot with Ruto come 2022 if he feels ready. "You are saying Ruto will not be on the ballot if you feel ready then be on the ballot with William Ruto, Kenyans are always doing the voting," Jumwa said. Jumwa, who is a close ally to Ruto, urged Kenyans to avoid taking Joho seriously. She stressed they know him well saying Joho might be speaking out of influence. "President Uhuru told them publicly that you are living with a corrupt person, we have enough agencies, take evidence there," she said. Joho who had accompanied Atwoli in Lamu said thieves are thieves and have only one name. Joho seemed to hit at DP Ruto. miadarati mombasa imeiba maisha ya wengi boss. Yea right, a chief is a chief. What was that Swahili saying about nyanis not seeing their own backsides but instead focuses on those of others?